Ozone therapy is a qualitatively new therapeutic solution to current problems of many diseases. More than 26,000 health professionals practicing ozone in different parts of the world. The application of medical ozone requires insight into the theoretical basis of respecting therapy procedures and techniques. The book gives information about the properties of ozone, their mechanisms of action, forms and methods of application. In its pages you will find instructions to correctly apply this valuable therapy following the recommendations of the authors, experts in research and clinical practice of ozone. This publication is available only for online reading. When making payment, you are buying unlimited access to it. The name of the author Oleg Malesnnikov, Ph.D, is written incorrectly on the cover, on pages II, III and XI as Malesnikov, should be read as Malesnnikov. We apologize for the error. The author’s last name Oleg Malesnnikov, Ph.D, has-been written incorrectly in the cover, pages II, III and XI as Malesnikov, It must be read as Malesnnikov. Caused apologize for any inconvenience. Ozone therapy is a qualitatively new therapeutic solution to current problems of many diseases. More than 26,000 health professionals practicing ozone in different parts of the world. The application of medical ozone requires insight into the theoretical basis of respecting therapy procedures and techniques. The book gives information about the properties of ozone, their mechanisms of action, forms and methods of application. 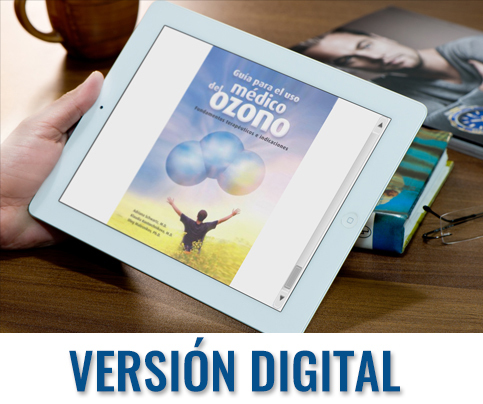 In its pages you will find instructions to correctly apply this valuable therapy following the recommendations of the authors, experts in research and clinical practice of ozone. Adriana Schwartz, MD, Obstetrician-Gynecologist, Director Fiorela Clinic, Madrid, Spain. Fiorela Director of Clinical Institute, San Pedro Sula, Honduras. President and founder of the Spanish Association of Medical Professionals in Ozone Therapy (AEPROMO). President of the International Federation of Medical Ozone (IMEOF), Secretary of the International Scientific Committee of Ozonetherapy (ISCO3). Professor of AEPROMO. Claudia Kontorschikova Nikolaevna, MD, Ph.D., Ph.D. in Biochemical Sciences. Female professor. Head of the Department of Clinical Diagnostic Laboratory, Medical Academy, Nizhny Novgorod, Russia. Oleg Viktorovich Malesnnikov, MD, Ph.D., Internist. Professor of the Academy of Medicine of Nizhny Novgorod, Russia. Gregorio Martinez Sanchez, Dr., Ph.D., Doctor of Pharmaceutical Sciences. Professor and Researcher. Scientific Director Medinat srl. (Ancona, Italy). AEPROMO member and the International Scientific Committee of Ozonetherapy (ISCO3). Professor of AEPROMO. Lamberto Re, MD, Ph.D., Professor, Clinical Pharmacology and Toxicology, Polytechnic University of the Marche (Italy). Director Medinat srl. (Ancona, Italy). AEPROMO member and the International Scientific Committee of Ozonetherapy (ISCO3). Irina Avenerovna Gribkova, MD, Chief Medical Officer of the Ozone Center of Nizhny Novgorod, Russia. Mirta Copello, MD, ophthalmologist, National Reference Center of Retinitis Pigmentosa, “Dr. Salvador Allende”, Havana, Cuba. AEPROMO member and the International Scientific Committee of Ozonetherapy (ISCO3). O. Genaddy Grechkanev, M.D. Ph.D., obstetrician. Professor, Department of Obstetrics and Gynecology of the Medical Academy of Nizhny Novgorod, Russia. Fernando Kirchner, M.D., traumatologist. Director Gabinet Mèdic Maresme, Mataro, Barcelona, ​​Spain. President of the Training Commission AEPROMO. Professor of AEPROMO.